I subscribed to WSR because I finished building my home theatre and no longer need to subscribe to magazines that give ideas on how to build a theatre. 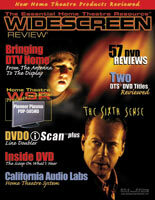 Widescreen Review focuses on the films I would like to see and the equipment I would like to upgrade. It is the next step to the home theatre experience.